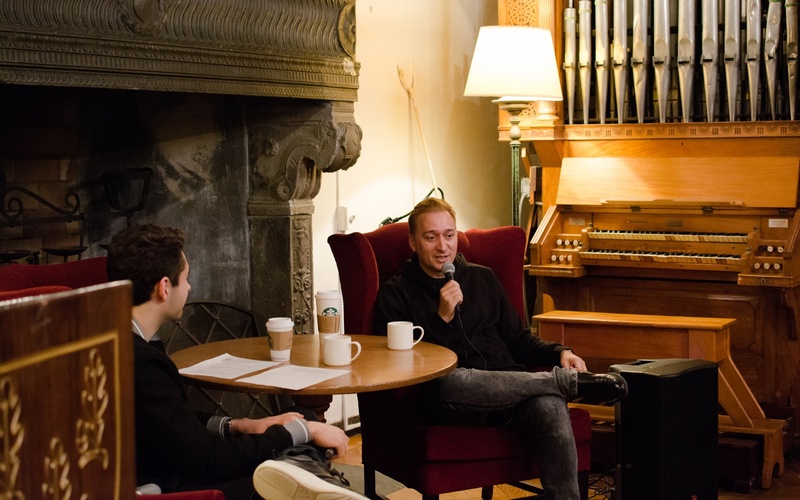 Paul Van Dyk in conversation with the Harvard Electronic Music Collective. Dozens of electronic music fans from Harvard and the Greater Boston Area filed into the Adams Lower Common Room on Feb. 20 to hear a talk from German trance music legend Paul van Dyk. Hosted by the Harvard College Electronic Music Collective, van Dyk discussed his life, his music, and his groundbreaking career. The crowd was a mix of college students and community members. Many attendees were long-time fans of van Dyk’s work: One woman said she had attended 80 of his shows, and another said she had been a fan for more than 20 years. Other guests included producers and DJs living and working in the Boston area. According to Fay Huo ’20, co-president of the Harvard College Electronic Music Collective, this diverse audience is typical for her organization. “We invite people from the greater Boston area, not only just Harvard students. We are very inclusive, actually,” Huo said. This is something we’re proud of. We strive to be a platform, a community, that can collect all the musicians, producers, and DJs that are interested in electronic music to come to our events,” she said.